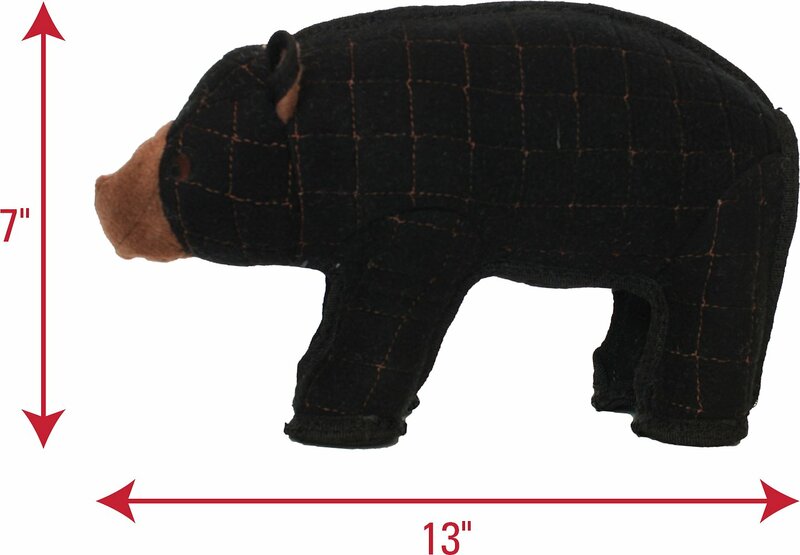 Tuffy's Zoo Bear Dog Toy is ideal for interactive play with one or multiple dogs. It’s made with three layers of safe, non-toxic fibers: soft fleece, industrial grade luggage material and plastic coating. All three are bonded and sewn together to make one ultra "tuff" layer, ensuring this toy is just as durable as it is fun. 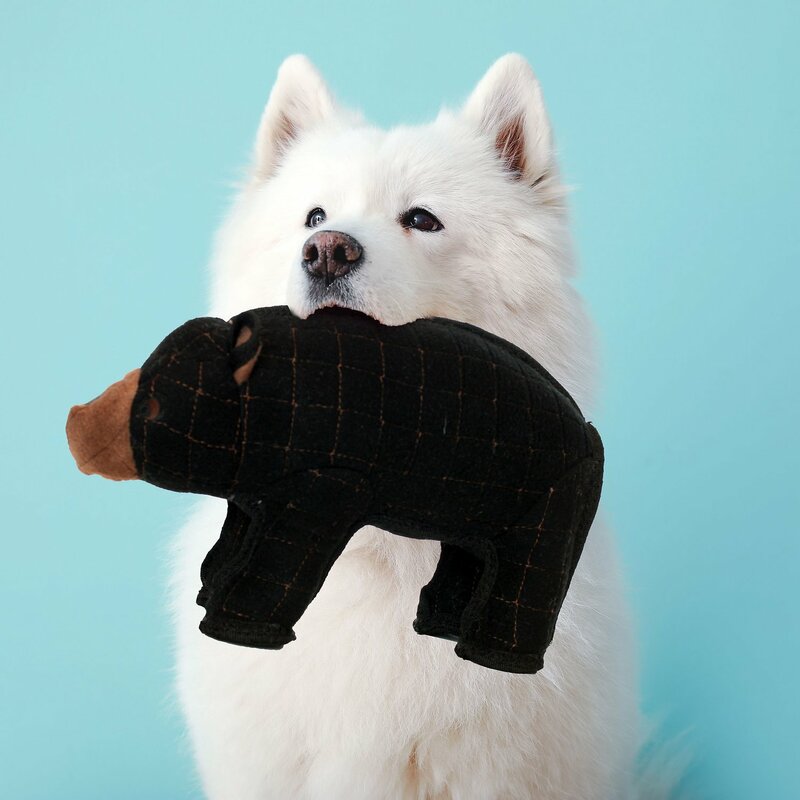 The Zoo Bear Dog Toy also has a protective pouch around its squeaker as an added safety measure in the unlikely event your dog gets to the core. This toy is great for indoor use because of its soft exterior, perfect for outdoor use because it floats in water and easy to clean because it’s machine washable. I read the reviews. I know my Shepherd Lab puppy is an aggressive chewer. Bought it anyway. By day 2 the end of a foot was chewed off and stuffing came out. I threw away stuffing. She’s still enjoying the rest of the bear. So I’m still glad I bought it. 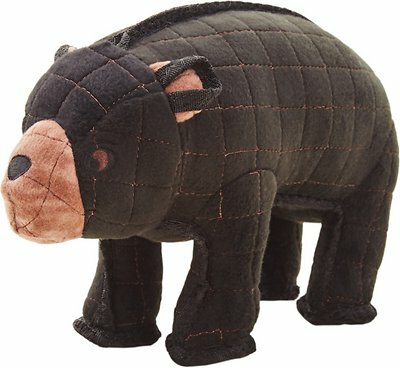 I got the regular size bear. He lasted all of 20 minutes before my parents Airedale tore the face open. I took out all the stuff and let her play with the shell. She loves the bear, and is very protective of him. Unfortunately he isn't as tough as I had hoped. Durable and Cute! And Heavy! Our 1 year old female weim loves this toy, we got the standard, larger size. She carries him around by a leg or ear and because it has a nice weight to it, I feel like it's also giving her a bit of a workout. She hasn't tried to tear him apart but I think it's durable enough to stand up to it. So for this toy has been holding up nicely. Other toys that were said to be very tough were history in a matter of hours. Hoping this toy will make it through the Holidays! Very disappointed. My dog found the weak spot (nose). It took her just 1 week. Tough toy. A little big for one of our dogs. But it will be good for guest dogs that are larger. My dog had chewed the nose and both ears in less than 20 minutes! Not a good toy for aggressive chewing! This one took longer for my boy to start taking apart. Within 20 minutes he had started pulling the stitching off and had started working on pulling the material off his leg.